…A Long Walk in Search of a Country, a Pint, and the Next Tee. 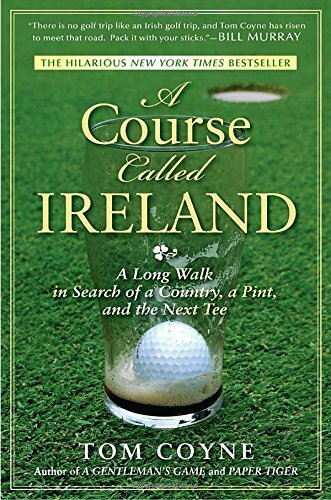 By turns hilarious and poetic, A Course Called Ireland is a magnificent tour of a vibrant land and paean to the world’s greatest game in the tradition of Bill Bryson’s A Walk in the Woods. In his thirties, married, and staring down impending fatherhood, Tom Coyne was familiar with the last refuge of the adult male: the golfing trip. Intent on designing a golf trip to end all others, Coyne looked to Ireland, the place where his father has taught him to love the game years before. As he studied a map of the island and plotted his itinerary, it dawn on Coyne that Ireland was ringed with golf holes. The country began to look like one giant round of golf, so Coyne packed up his clubs and set off to play all of it-on foot. A Course Called Ireland is the story of a walking-averse golfer who treks his way around an entire country, spending sixteen weeks playing every seaside hole in Ireland. Along the way, he searches out his family’s roots, discovers that a once-poor country has been transformed by an economic boom, and finds that the only thing tougher to escape than Irish sand traps are Irish pubs. About the Author – Tom Coyne is the author of the New York Times bestseller A Course Called Ireland, Paper Tiger, and the novel A Gentleman’s Game, named one of the best twenty-five sports books of all time by The Philadelphia Daily News, and adapted into a motion picture starring Gary Sinise. He has written for GOLF Magazine, Golfweek, Sports Illustrated, and numerous other publications. He earned an MFA in fiction writing from the University of Notre Dame, where he won the William Mitchell Award for distinguished achievement. He lives in Philadelphia with his wife and two daughters, and he is an associate professor of English at St. Joseph’s University.